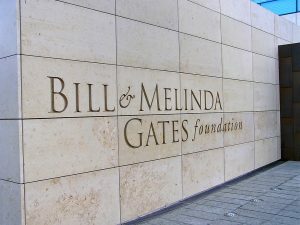 The Bill & Melinda Gates Foundation has announced it will invest close to $1.7 billion over the next five years on new initiatives in education philanthropy. Bill Gates announced the new plans during a speech at the Council of the Great City Schools’ annual conference in Cleveland. More than 1,000 people came to Cleveland for the conference, representing urban schools across the country. The Gates Foundation has been involved in education philanthropy for more than two decades. The organization has poured billions of dollars into advancing new ideas. An Obama administration’s education grant program, called Race to the Top, gave states hundreds of millions of dollars to carry out those education policy changes. A main focus of the new initiative will be building networks of schools. The foundation’s vision includes funding up to 30 networks, focusing first on high-needs schools and districts. The school networks will share different ideas, pilot programs and other data in order to help the group as a whole. Building networks of existing schools and supporting the development of new curricula is expected to account for about 60 percent of the new $1.7 billion investment. These networks could consist of districts or schools with similar interests. One example discussed at the conference was the LIFT Education network in Tennessee, a coalition of 12 districts that work together on finding solutions on common problems. Over the next 30 to 60 days, the foundation plans to gauge interest from nonprofits and other education organizations about leading school networks. The foundation eventually will begin working with chosen intermediaries to pick specific schools to participate in its networking effort. This is a step back from the foundation’s traditional education reform agenda. The foundation previously pushed to base teacher evaluation and compensation systems in part on student test scores. According to reports, the foundation will no longer invest in new initiatives designed to tackle teacher evaluation and compensation. Instead, it will increase funding for curriculum design and professional development that has been aligned to states’ standards.